At last something you can give to someone who works in IT Service Management (ITSM), or ITIL or COBIT or ISO/IEC 20000. Let's face it - ITSM is not the most exciting industry. Up to now, finding gifts for colleagues, staff, clients and friends who work in these areas has been challenging, to say the least. But no more! Get them this book. With such an innocuous title you can even expense it. New Zealand author Rob England has done what many said was impossible: written a funny book about IT (Information Technology). This feat is more startling because the topic of the book is ITSM (IT Service Management), a notoriously dull area even by IT standards. But feedback from readers is consistent: this book is funny. How IT is done is described in cynically skewering detail which will delight all those who have IT done to them. From the Wright Cycle for process improvement (“Guess-Do-Crash-Fix”, named after the Wright brothers who crashed a few in their time) to the Known Idiot database maintained by the Service Desk, the Real ITSM DeathCycle parodies and nails every Worst Practice of IT Service Management. IT Operations is not the only victim. 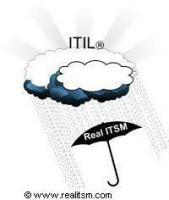 The ITIL industry comes in for a jab or two. The Real IT Service Institute, or RITSI, meets in resorts worldwide. Graduates of the Real ITSM training courses are transformed overnight into experts able to advise corporations. RITSI’s Real ITSM content is maintained by DogmaITSM and its analyst relations program is known as ParasITSM. The book is not all tom-foolery. It introduces such ideas as numbering incident priorities from zero up, based on the number of metaphorical fans being hit by excrement; the concept of on-demand classification of objects; and how the IT department can best harvest the benefits of catastrophes. They'll laugh. They'll cry. They'll nod grimly. They'll thank you. Get the Introduction to Real ITSM. You can buy the book from Amazon . Ship direct to the recipient. Buy now for $24.50 reduced to $19.95 for Xmas - hurry!!!!. ..or click here to find out more about the book, see some reader feedback, and enjoy extracts from the book. Submitted by guest on December 9, 2008 - 12:28. Submitted by rob on December 16, 2008 - 10:42.